I fear he is right, and we baby boomers are, for the most part, responsible for this. After all, we’re the ones in charge now. Are we funding health care and education so that it is available for everyone? Are we making affordable housing, public transportation, and child care a priority so that low-wage earners don’t have to struggle so much? No, no, and no. I don’t even know what to call this fever of selfishness that has swept through our country. (And we thought Ebola was dangerous!) Conservatism doesn’t begin to describe what is happening. Libertarianism? That, too, seems inadequate. Perhaps we should just call it rampant selfishness and leave it at that. There’s a whole class of people whose philosophy is “I’ve got mine, now to heck with you.” And their vision seems to be prevailing. I see it in Maine as our governor proposes cutting taxes on the rich while reducing revenue sharing to Maine towns and cities. A few of the more affluent communities can weather the cuts, but most towns scramble frantically to cope with reduced revenues. Either services must be cut or property taxes must be raised. Usually it’s a combination of the the two. In the little town of Winthrop—population 6,000—the town council is struggling with a budget shortfall that is a direct result of the governor’s policies. I am sympathetic. I understand what a difficult job it is to provide services when there is not much of a tax base. There are few big businesses in town, and much of our revenue comes from property taxes on homes. When it comes to cutting the budget, our library is a tempting target, and this year it is in the crosshairs of the town council. The library’s budget might be small—less than $300,00 out of a total town budget of 17 million—but to some the library can seem like a totally discretionary expense. After all, the feeling goes, nothing very bad will happen if the library’s budget is cut. Oh, sure. Hours might have to be reduced. So what? As long as the library is opened a few days a week, what does it matter? Author talks might be eliminated. Who needs them anyway? Fewer books will be purchased. Didn’t the library buy new books last year? To me, a library, however small, is priceless. It brings so much good into a community that it seems almost impossible to place a dollar value on it. Everyone in town is welcome to check out books and DVDs, and it doesn’t matter who your family is or how much money you make. As long as your hands are clean and you return the books and DVDs, you are welcome. Thanks to the library, the world of stories and ideas is at your fingertips. You can go anywhere, even if you don’t have much money. But, as it turns out, a dollar value can indeed be placed on our library’s services. According to Richard Fortin, our library’s director, about 52,000 items—books and DVDs—were checked out last year. If Winthrop library patrons had had to collectively buy this many books and DVDs, then they would have spent over a million dollars. It is beyond the scope of this post, indeed this blog, to prescribe a cure for the fever of selfishness in our society. I can only voice my opposition and hope that a cure comes soon. Well said, Laurie. 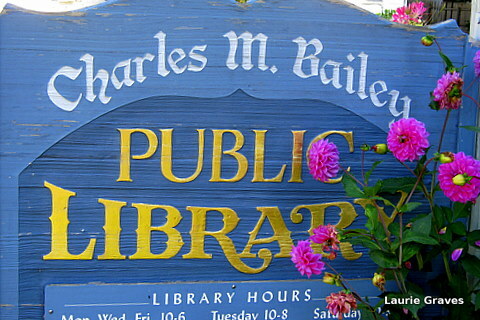 Our library is a FOREVER asset to our town. Thanks, Pearl! I know you and George love the library as much as I do. Oh, I would not survive without my library! Even if I could afford to buy all the books I read, where would I put them? I am SO thankful for our library system.AND – Two years ago they started a seed bank! I get heirloom seeds & at the end of the season return some if I can – really exceptional ! I agree, Jodie. And while we have a house full of books, there is a limit. Plus, you don’t want to own every book you read. And then there are those who live on a tight budget and simply can’t afford to buy very many books. In central Maine, there are many people in this category. Yes, yes, Judy! Libraries and librarians are a treasure. As for the younger generation…I think it is still too early to see what kind of leaders they will be. (I have high hopes for them, despite their predilection for taking selfies.) Instead, I was referring to the generations that came before my boomer generation—my parents’ and my grandparents’ generation, when so much progressive legislation was passed. They were far more selfless, as a whole, than my generation is.